When travel vlogger Lost LeBlanc declared his admiration for Manjuyod Sandbar and fondly called it as The Maldives of The Philippines, I was stoked! The natural beauty is in MY HOME ISLAND - Negros! And it is only a 5-hour drive from my home town. So, in spite of having a tight vacation schedule last December, my aunt and I made it a point to bring the family in this newly found gem. We were able to squeeze a 3-day Dumaguete family getaway with a side trip to Manjuyod Sandbar in between the holiday rush and Christmas reunions. Internet-famous, but still an offbeat destination, Manjuyod Sandbar is definitely worth a visit. Before you pack your bags, here are 5 things to remember when planning for a trip to the place they call The Maldives of the Philippines. Manjuyod Sandbar is a SANDBAR! It is only picture-perfect during low tide. Gosh, I can't believe I'm emphasizing that, but consider it as a reminder as I forgot it myself. Boohoo! Good thing, my aunties did their homework quite well and I pretty much relied on them in this entire trip. Our visit to Manjuyod Sandbar was perfectly scheduled on a low tide, low enough that we were able to see the 7 km stretch of powdery white sand! Props to the Aunties! That's my fambam over there! And those are the famous cottages on stilts! Manjuyod Sandbar is located off the coast of Bais. To get there, you must rent a boat for a day and this should be facilitated by Bais Tourism Office in advance. We passed by Bais before heading to Dumaguete on the first day of our family vacation. There, we scheduled our boat trip to Manjuyod Sandbar at 7 AM the next day. Booking was easy and the tourism officer was helpful. He arranged a big boat good for 20 people although we're only a group of 10, and gave us the contact details of the person in charge of the boat. Boat rental was at 3,500 PH Pesos during our trip (December 2016). We paid 1,000 PH Pesos as a down payment at the tourism office and settled the remaining balance with the boat in charge after the whole trip. 3. Do not expect luxury! Despite of being called as The Maldives of The Philippines, Manjuyod Sandbar is not a luxurious destination. Manjuyod's fine white sand and clear blue waters may have a strong resemblance to The Maldives, but it doesn't offer opulent water villas, lavish seaside meals and 5-star service. There are cottages on stilts and these are simple accommodations that can only provide basic needs. Cottage rental is at 3,000 PH Pesos for daytime use. Overnight rate is 4,000 PH Pesos and 24-hour use is 6,000 PH Pesos. The boat that we rented is spacious and has table where we can have our food; hence we opted not to rent a cottage. And besides, we wanted to go back to Dumaguete right after lunch. Not as luxurious as The Maldives, but just as beautiful and romantic! There are no restaurants in Manjuyod Sandbar! There are local vendors selling oysters, sea urchins and fresh coconuts, but I bet you wouldn't last long on those. The best thing to do, if you ask me, is to bring packed breakfast since you have to wake up early and be there at low tide. Bring lunch, drinks, fruits and chichiria as well! 5. Don't forget the sunscreen. You'll be under the sun most of the time because Manjuyod Sandbar is in the middle of the sea. So, slather on sunscreen, wear rash guard if you must and protect those eyes with cool sunglasses! The boys. The sandbar. The water cottages. Now, I guess you're ready! Pick the perfect date and time based on the tide. Book your boat! Pack your food and sun protection. Expect less and enjoy Manjuyod Sandbar just as it is. It is soooo beautiful. You'll surely love it! 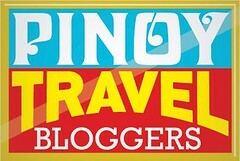 This is my entry to Pinoy Travel Bloggers' Blog Carnival: Best Upcoming Destinations for 2017 hosted by Filipina Explorer. Searching for more places to visit in my home island? good info and tips here! While there are no luxury accommodations and restaurants, it's great that this place is loved for it's natural beauty. Sometimes it's nice to just have very little and just enjoy what you have in front of you!